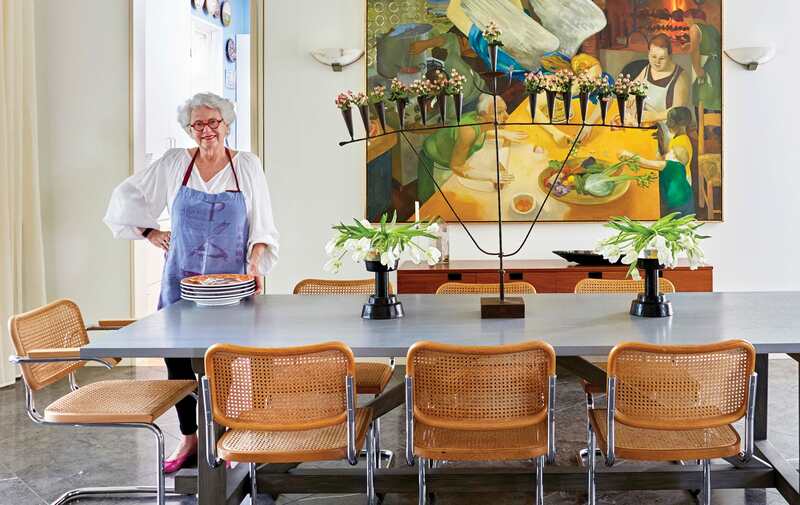 Paula Lambert poses by the dining table at her Turtle Creek home in Dallas. In front of the cobalt-blue door to the Frank Welch–designed house in the small gated Park Bridge Court enclave in Dallas, Paula Lambert welcomes and bids arrivederci to friends and acquaintances. It seems fitting that they’ve crossed Turtle Creek itself by way of a private drawbridge-like lane to greet the founder of the Mozzarella Company. The warm, stunning home belies Lambert’s royal standing as America’s cheese queen; its interiors are a portal to her genuine, approachable personality and mirror her full, modern, eclectic lifestyle. The house overlooks Turtle Creek on one side and the Katy Trail, a railroad track turned urban foot and bike path, on the other. Inside, personal effects tell a lifetime of rich stories. This home is the culmination of decades of loyal friendships, art collecting, travel, loving relationships, and passion for work and life that only a self-made businesswoman, honorable Dame d’Escoffier, gracious hostess, and philanthropist could bring together in an inviting celebratory fashion. Lambert’s residence exemplifies the difference between a house and a home. Remembering her initial trip to Italy, she says, “I fell in love with the light—the color of the light there.” In the early 1960s, the Fort Worth-raised University of Texas graduate visited a friend and was enamored instantly with the country, its food, and its people. She moved to the Umbrian town of Perugia in 1965 and took odd jobs, did translations, taught English, and, eventually, gave wine tours at the noteworthy house of Lungarotti in Torgiano. Lambert also attained the US equivalent of a master’s degree in Italian, which she speaks fluently—admittedly with the best Texas accent. Lambert’s current home decor includes an eclectic mix of art from her own collection and that of her boyfriend, George Works, carefully curated by interior designer Dan Nelson. One is never too far from great art in the Lambert-Works home. Prior to her relocation, young Paula had met young Jim Lambert at a wedding. Jim traveled in the summer months when he wasn’t working as a landscaper. On learning that he was going to Europe, more specifically to Italy, a friend asked, “Are you going to look up Paula?” He did. The two married in 1973, and after Jim completed his University of Georgia master’s degree in landscape architecture, they moved to Dallas in 1975 where he opened his own firm. 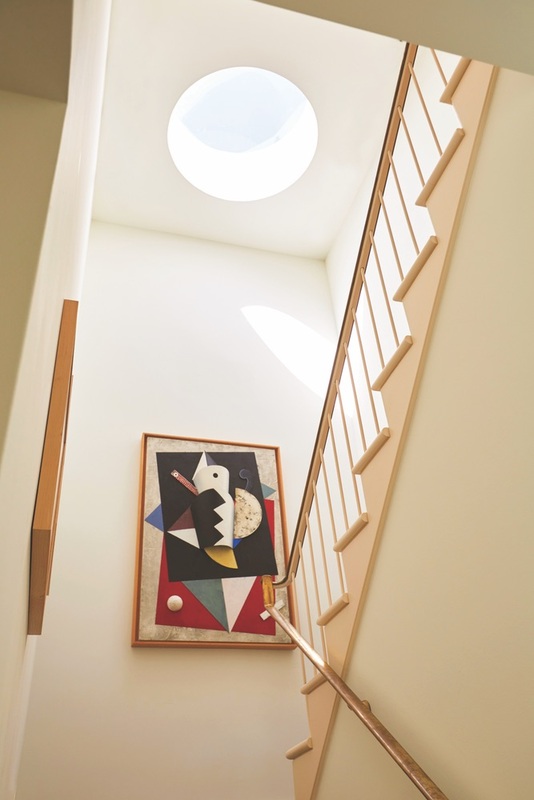 The postgraduate newlyweds moved into a townhouse Jim owned, which, coincidentally, was also designed by Frank Welch. It’s noteworthy that two of Paula Lambert’s homes were designed by modernist architect, remembered lovingly in his field as the Dean of Texas Architecture. Mentored by the legendary O’Neil Ford, Welch had a unique talent for weaving the natural environment with warm, sophisticated modernism, always peppering his oeuvres with subtle Texas accents. 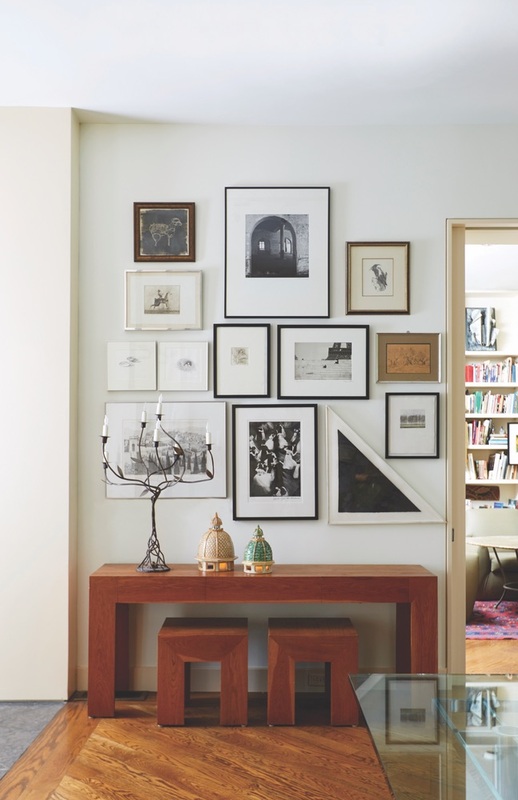 Lambert points to a wall of black-and-white artwork in her living room. Hanging above Henri Cartier-Bresson’s coveted Dance the Night Away (1959) is a Frank Welch photo of a man in the foreground sitting on steps with the base of the Eiffel Tower in the background. Lambert seems almost prouder of owning the architect’s photo than the famous French photographer’s image. Lambert capitalized on her love affair with Italy by launching a well-conceived, timely business that has allowed her to travel between Dallas and the bel paese for the last thirty-six years. Lambert shares this new home with her boyfriend, George Works, who is retired from a family real estate business. Works and Paula’s late husband were close friends from the time the newly married Lamberts moved to Dallas from Georgia. Works stood by his pal Jim’s side for twelve years following a debilitating stroke; Jim passed away in 2011. Today, the full and interesting lives of Lambert and Works serve as their home’s backdrop. To coalesce art, furniture, objets d’art, and color, Lambert relied on longtime friend and designer Dan Nelson of Vision Design, Inc. Nelson’s projects include everything from five-star island resorts and hotels to some of the most well-appointed homes in Dallas. 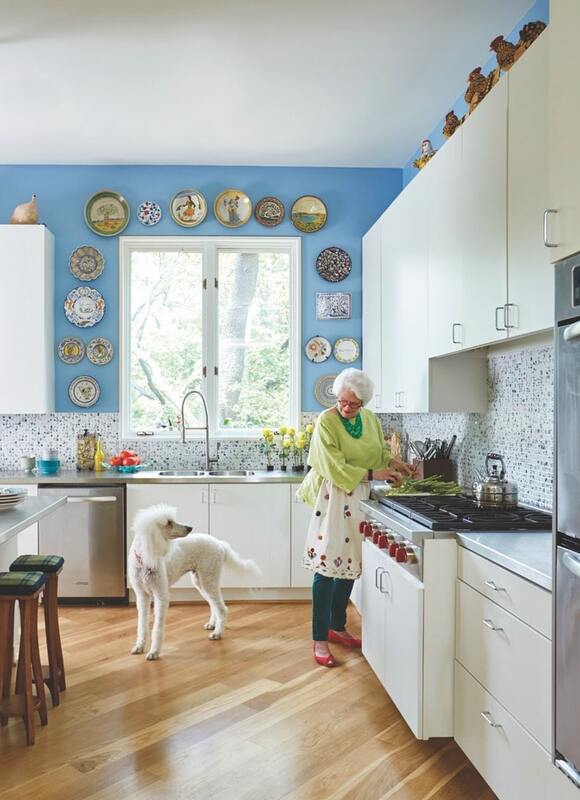 Paula Lambert works in the kitchen of her Dallas home with her faithful four-legged companion. The open and airy kitchen at Lambert’s Turtle Creek home in Dallas, Texas is perfect for cooking and entertaining. “Paula is the Energizer Bunny,” Nelson declares, referring to her vitality and on-the-go lifestyle. After looking for months, it was a delightful surprise when the Welch-designed Park Bridge Court house became available. 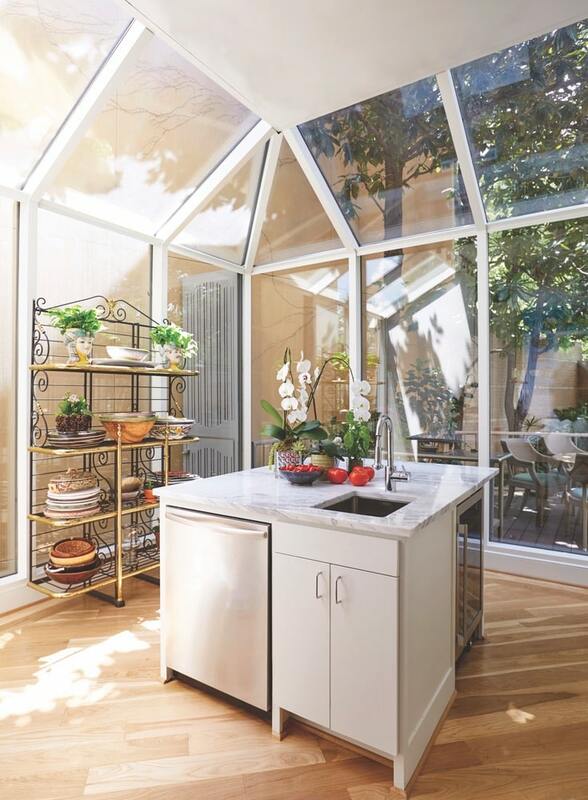 Giving the illusion that it’s smaller than its five-thousand square feet, the sizable living spaces with loft-height ceilings don’t overwhelm. The house packs a Palladian punch; although large, the rooms envelop the couple in stylish life-sized comfort. “That’s Frank for you,” Nelson says of his late architect friend. 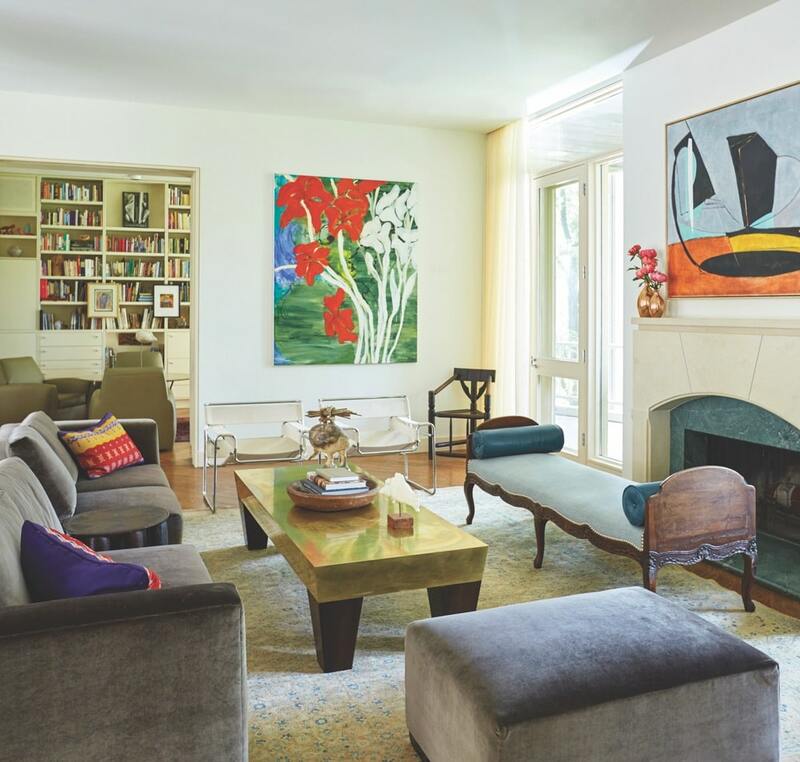 In his functions as both interior designer and editor of sorts, Nelson cites the living room’s coffee table as an example of how he and the cheese queen worked well together. “Paula sent me a photo of a dining table she liked in a London restaurant,” he says. Since Lambert wanted a farm-style table for her dining room, Nelson conceived of a modified version of the London treasure and had the refined stout, brass-clad coffee table custom made. Not for lack of looking for the right one, he also combined the best of his and Paula’s visions for a farm-style dining table and had one made. Depending on which of the two you ask, it seats twelve or fourteen. In a clever nod to Lambert’s previous Turtle Creek home, Nelson repurposed a rug and converted it into a slipcover for the daybed in her book-lined office. The sofas and living room rug were Nelson’s finds from a high-end consignment shop. Original art is everywhere. 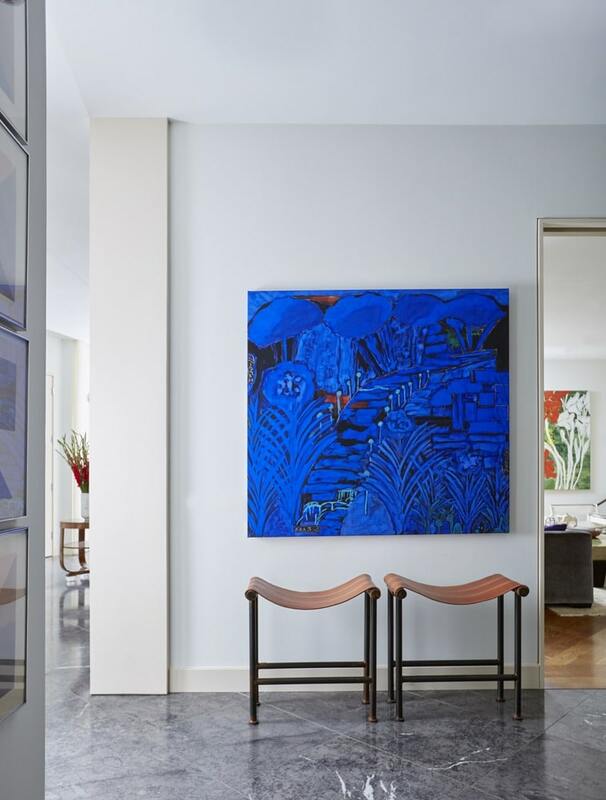 As if made to hang near the front door (the color of which was inspired by the garden gate at Lismore Castle in Ireland), an Arie Van Selm painting, resplendent with the same cobalt blue, commands attention. Van Selm is a Dutch artist who, like many of the artists in the Lambert-Works home, has a Texas connection. He lives in Dallas. Nelson chose Works’s large wooden whale sculpture by folk artist Willard Watson, known as the Texas Kid, to sit atop Lambert’s former dining table, creating a visual break between the foyer and the living room. 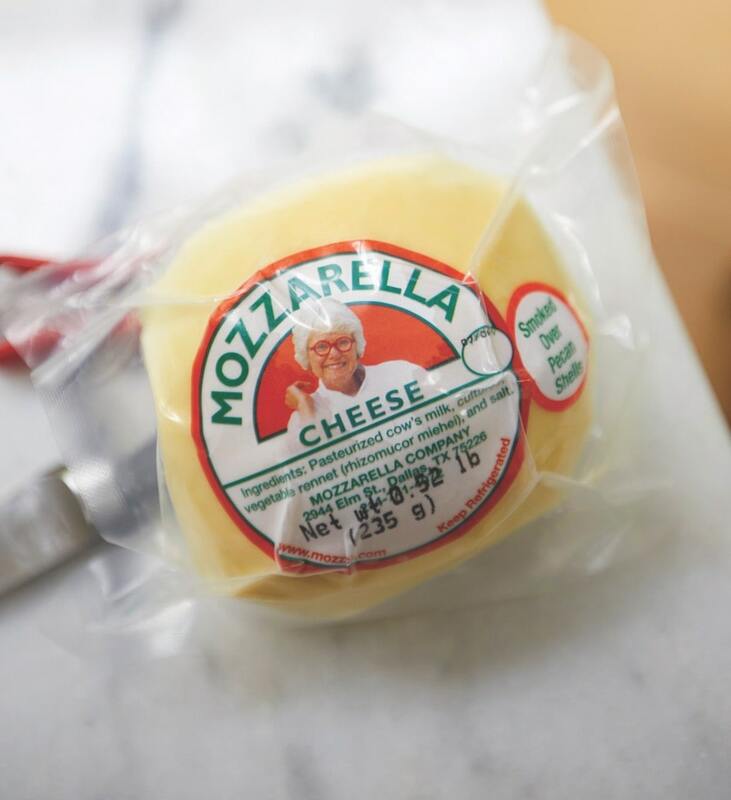 Since its inception in 1982, Mozzarella Company has grown to a twenty-person operation that offers thirty award-winning types of fresh and aged cheeses and ships almost anywhere. Lambert is at its helm, ever the erudite cheese authority and doyenne of good taste. 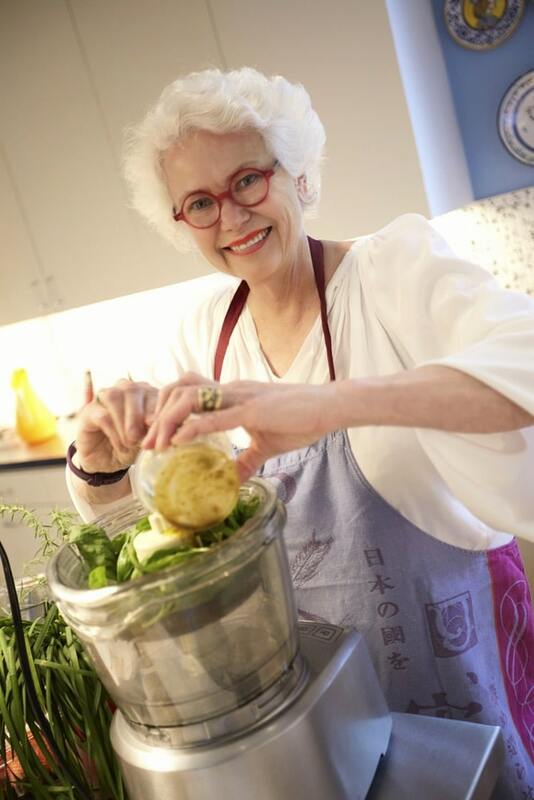 She has spent decades cultivating the exchange of ideas, and her expertise and sophistication reveal themselves in regular television appearances alongside some of the nation’s best chefs. Lambert is active in many culinary organizations and was instrumental in improving cheese competition standards so that judging is fair. Lambert’s art collection and style have been greatly influenced by the Italian culture she loves. Custom furniture pieces commissioned by designer Dan Nelson complete the modern yet eclectic and artful home of Paula Lambert and George Works in Dallas. Paula Lambert founded the Mozzarella Company in 1982. When a dinner party is afoot in the Lambert-Works home, there’s a bustle of activity in the renovated kitchen as friends help Lambert prepare food that will go to the dining room’s beautifully decorated farm table. On the wall between the two most important rooms of the honorary Italian’s house hangs a Barnaby Fitzgerald painting of Umbria’s Monte Subasio. Art and life imitate each other on these glorious evenings. Paula’s character in the existential canvas, as it is in the dinner scenario, is an angel—a being of light floating and engaged among loved ones. The irony? Fitzgerald uses egg tempera paint. Visit MozzCo.com to learn more about the Mozzarella Company.